Enriched Foam Hand Soap Refill with moisturizers is designed for use with Rubbermaid's One Shot System that sets the standard for quality and reliability in counter-mounted soap dispensing. Luxurious, pH-balanced soap formula encourages healthy hand-washing with a fresh light citrus fragrance and rich teal color. Patented Smart Sensor technology on the dispenser (sold separately) detects hands and automatically delivers the perfect amount of soap. Touch-free delivery eliminates cross-contamination to help reduce the spread of germs and encourages use. Controlled dispensing of concentrated soaps eliminates overuse and costly waste. Refill delivers a high yield of hand washes - up to 2,000 per refill. Disposable hygienic refill keeps soap fresh and germ-free. Refill is Green Seal certified. INNER PACKAGING: 1,600mL Per Refill. 4 Refills Per Case. 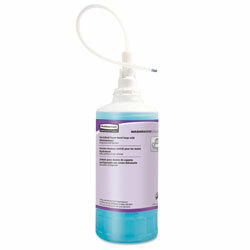 1,600 mL Teal Soap Dispenser Refills from Rubbermaid! 519 In Stock today.